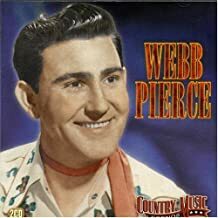 Webb Pierce lyrics are a good representation of yesterday’s country music with a distinctive voice that is recognizable today. Browse this web site for guitar chords and lyrics for many different country artists. Webb was a very successful recording artists and businessman during the 1950’s and 60’s. His music is a lot of fun to play and sing, choose your favorite Webb Pierce lyrics with chords and have a good time. Among his most famous songs of the time were “There Stands The Glass”, “In the Jailhouse Now”, “Fallen Angles” and “Slowly”. The Hawaiian steel guitar was quite popular in the Nashville sound but when Webb’s song “Slowly” came out introducing the “pedal” steel guitar it brought a new sound to country music.